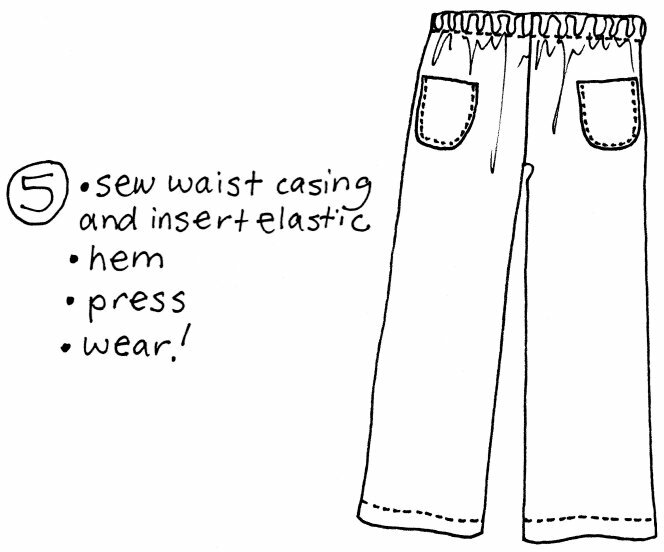 Hello All, today here’s a simple draft for a pair of pajama pants. 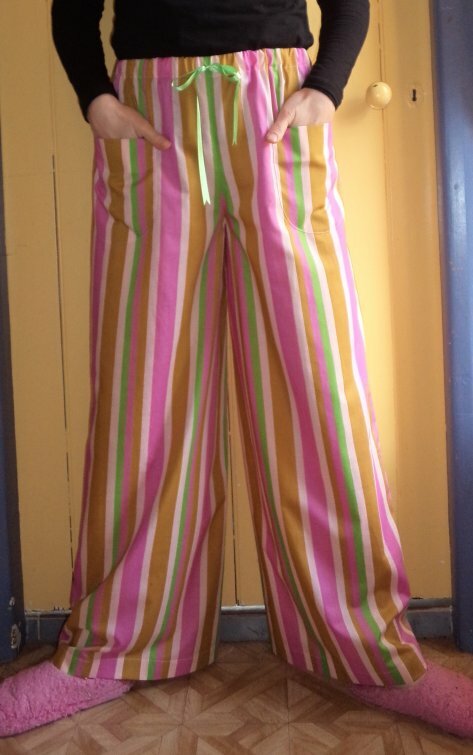 They could also be shorts, three-quarter length, or whatever length you like. 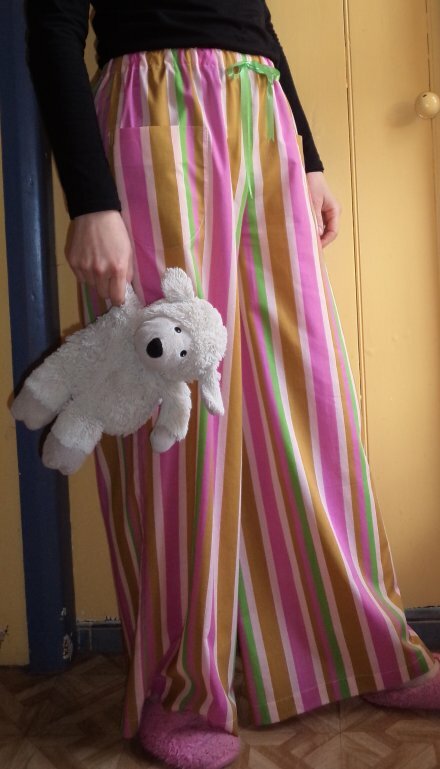 This pattern is very nearly a zero-waste pattern. 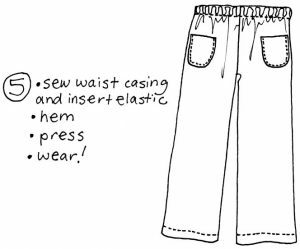 If your hip measurement is 39″ or less and your fabric width is 150cm, then you’ll have almost no waste at all. 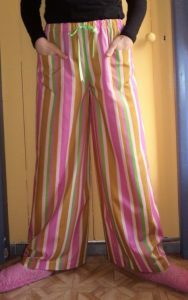 The pajama pants have two rounded patch pockets and an elastic waist. The ribbon bow is there for decoration. The leg cut is fairly wide and flow-y. 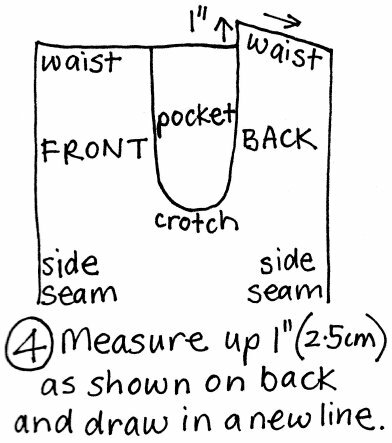 To draft the pattern you’ll need your hip measurement, pants length measurement, a ruler, pencil, L-square and paper. Take your hip measurement around the fullest part of your bum/seat, which is about 20cm (8″) down from your natural waistline. 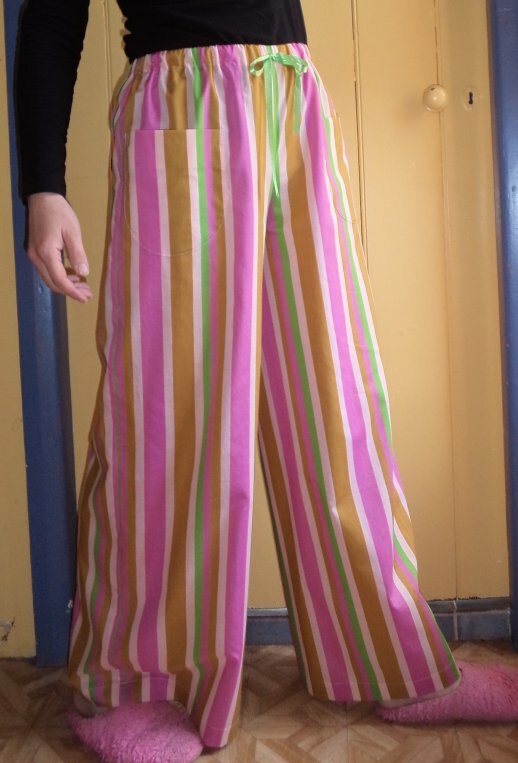 If you want to make baggier pants, add a couple of inches to your hip measurement. Note, though, that it will make the leg wider too. 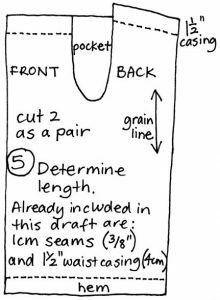 If you’re not sure, just give yourself big seam allowances on the side seams when you draft the pattern, then you can fine-tune the bagginess when you sew them. 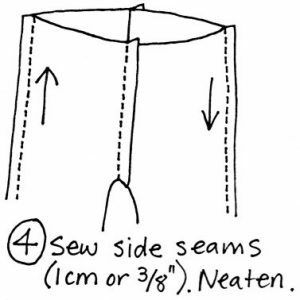 Fabric requirements: For 112cm (45″) wide fabric, you’ll need twice your length. 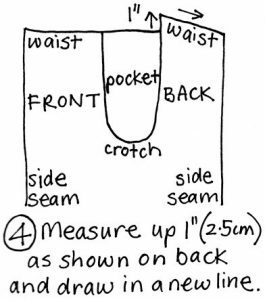 For 150cm (60″) fabric, you’ll also need twice your length unless (as already mentioned) your hip measurement is 39″ or less; in that case only once your length. 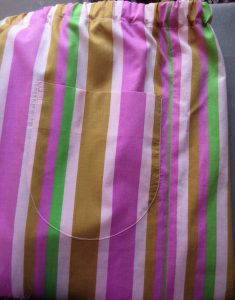 The striped fabric I used is a lightweight cotton. Step 1: Begin with a rectangle. 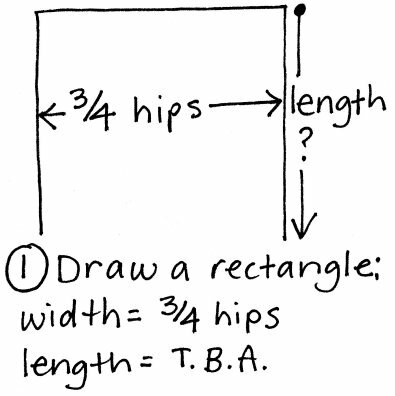 Make the width 3/4 of your hip measurement, but don’t commit to the rectangle’s length yet. 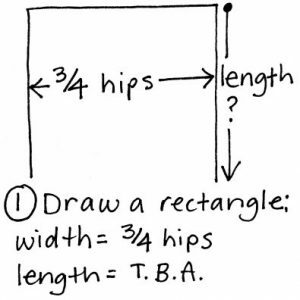 My hip measurement is 38″, so the width of my rectangle is 28.5″. 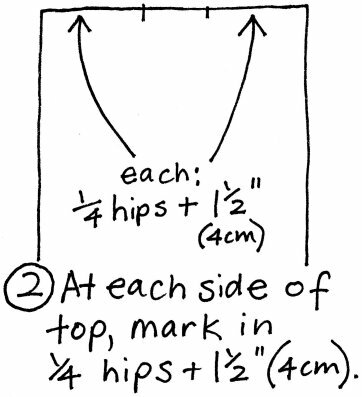 Step 2: Calculate 1/4 of your hip measurement (mine is 9.5″). 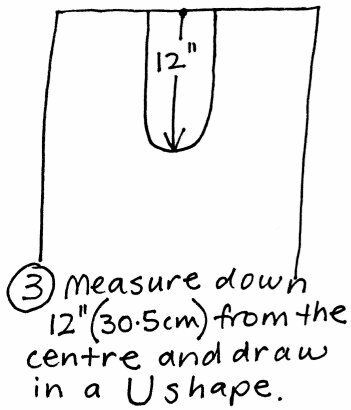 Add 1.5″ (4cm) and mark in as shown. Step 3: Fold the paper in half to draw a symmetrical U shape. 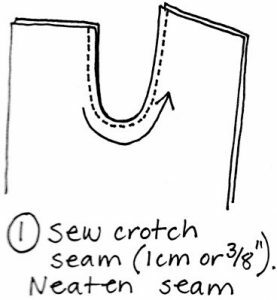 This U shape forms the crotch depth, and can be made lower if you find it’s too high when the pants are finished. 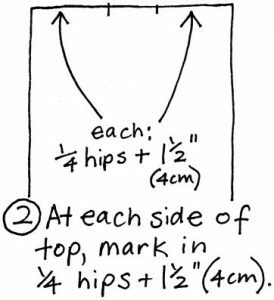 12″ suits me (38″ hips), but if you have (40″, 42″, 44″, 46″) hips, try making it (12.25″, 12.5″, 12.75″, 13″). Err on the high side because if it’s too low you can’t make it higher. 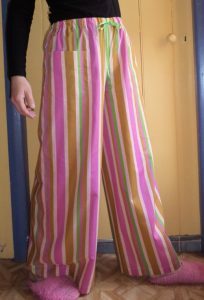 Step 4: Are you starting to see the shape of the pants pattern yet? 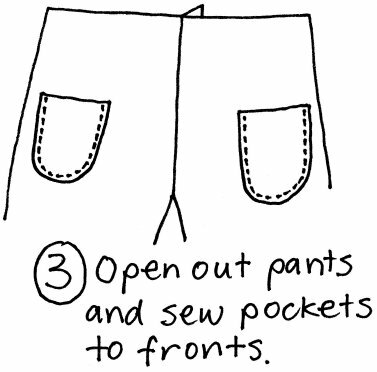 The front and back are joined at the inside leg, so there’s no inside leg seam. In this step we’re making the centre back waist 1″ higher so it’s more comfortable and we don’t get an eyefull when you bend over! 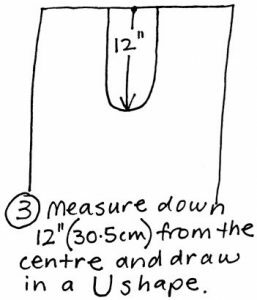 Step 5: Draw in the final length, allowing for a hem too. I made mine 111cm (43.75″) from top cut edge to bottom cut edge. 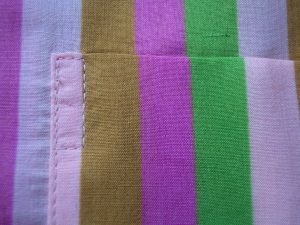 I took a 1.5″ hem. Sewing step 1: This seam can be stitched in a lower U if you find the crotch is too high when the pants are finished. 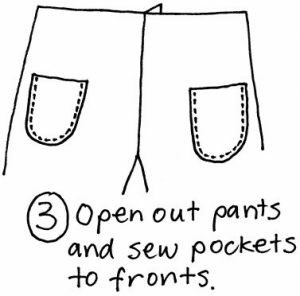 Sewing step 2: The top of the pockets has a double folded hem; this can be stitched or left unstitched. I left mine unstitched. 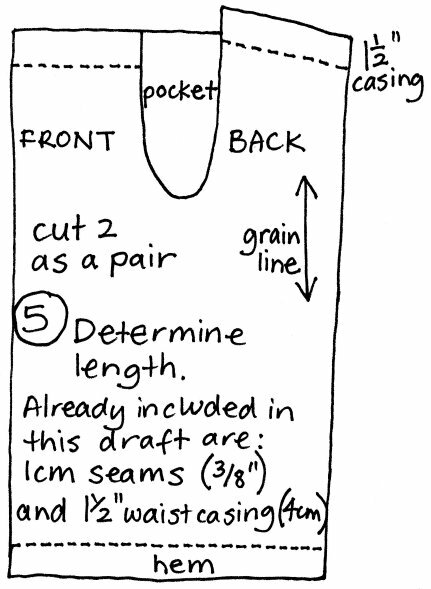 Sewing step 3: I sewed my pockets on 6.25″ down from the top raw edge, and 1″ in from the side raw edge, but of course you can sew yours on wherever you like. 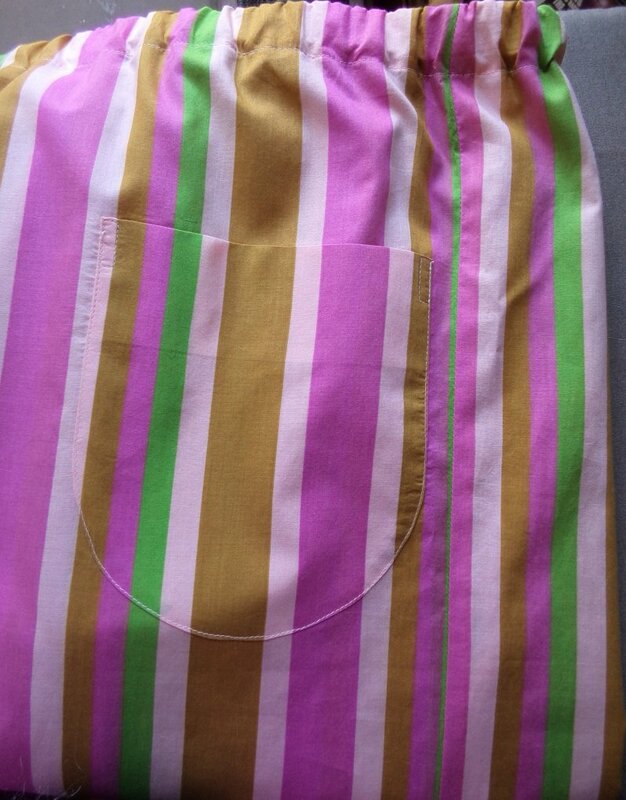 By some miracle, totally unplanned, the stripes matched on each pocket! 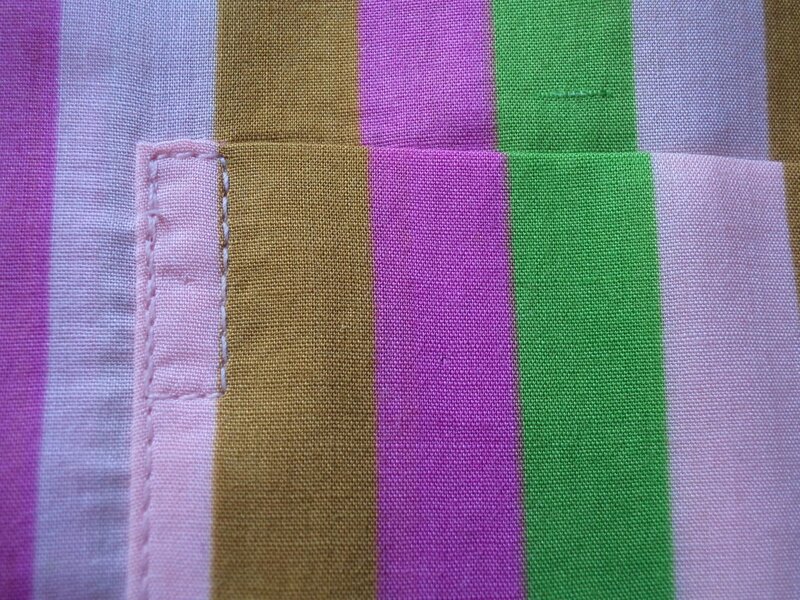 I highly recommend reinforcing the top corners of the pockets with rectangular or triangular stitching. 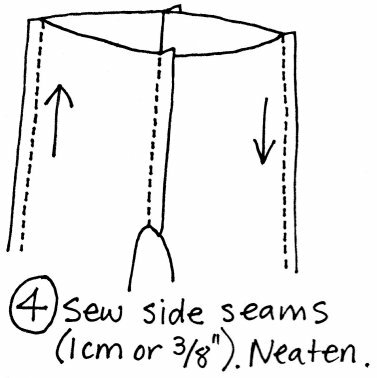 Sewing step 4: If the fabric is fine, hold the seams taut under the machine as you sew them. This will help them sit flat. Sewing step 5: The final bits! I added a bow at the centre front. 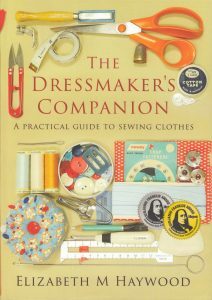 You could also stitch ribbon around the hems, or add some decoration to the pockets. 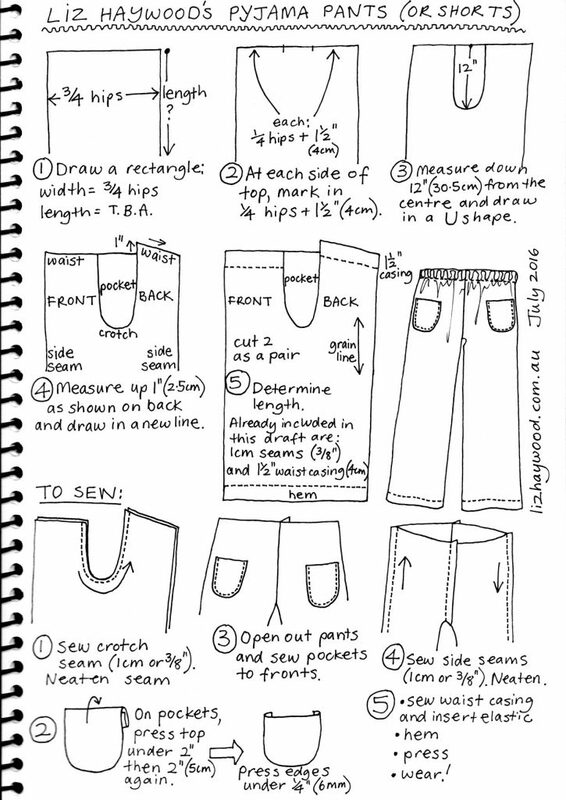 You might also enjoy another zero waste trousers pattern here.